As a child part of the excitement of birthday’s was seeing what cake my Mum had made for me. As a teenager and early adult, I always believed that making a birthday cake was too difficult for me to do. But I’ve since discovered it’s not and I really enjoy making them for my kids. I’m lucky that I love baking and do try different cakes but I wanted to give you a really easy birthday cake recipe for you to make when you need to. 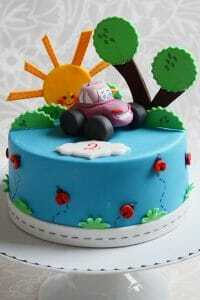 This gives you your complete how to make a birthday cake and will make a standard round cake 7 inches diameter. Grease tin and line with greaseproof paper (Baking Parchment). When it is fluffy add the eggs 1 at a time mixing well. Then add the vanilla and mix again. Sift in the flour and fold in gently. Divide between the 2 tins and create a well in the center of each to achieve an even cake top and less waste. Bake for 30 minutes or until a skewer comes out clean (this will depend on your oven, a fan assisted oven will be quicker and may need a slightly lower temperature). After 5 minutes remove from trays and then leave on a cooling rack until they are at room temperature. When the cake is cool wrap the cake in clingfilm (saran wrap) and put in the fridge to firm up. Leave it for at least an hour or overnight if you can. Make buttercream by mixing 100g butter to 200g icing sugar, mix until creamy (it will get there but it does take some elbow grease) and then add half a tsp of vanilla extract. If the buttercream is too thick then add a splash of milk a tsp at a time until it’s a thick spreadable consistency. Put buttercream and jam(jelly) to sandwich the cakes. Then add, a coat to the whole cake, do this by using a spatula. (this will stop any crumbs coming loose and spoiling your icing, it will also give your icing something to hold on to). I use ready to roll fondant icing – if I am using white then it is easiest to use a ready rolled icing like this one that you can get from Amazon or in the supermarket in the UK. However, some cakes I’ve made in the past use colored fondant so I either buy it ready colored or I use food coloring paste (DO NOT USE LIQUID) and white ready to roll fondant. Roll out (use a sprinkling of cornflour/cornstarch on the surface to stop it sticking) the icing wide enough to cover the cake but not too thin of every little bump will show through your aiming for a depth of 5 to 7mm. Once this is done place your rolling pin in the middle of the icing and fold the icing over in half and lift the rolling pin gently and place in the center of your cake, now lift the flap which is over the rolling pin and smooth over the top of your cake with your hand. carefully making sure not to apply pressure (so you don’t tear the icing) smooth down the sides and cut any excess off with a sharp knife or a pizza cutter if you have one. Now you’re ready to add anything you like to your cake. 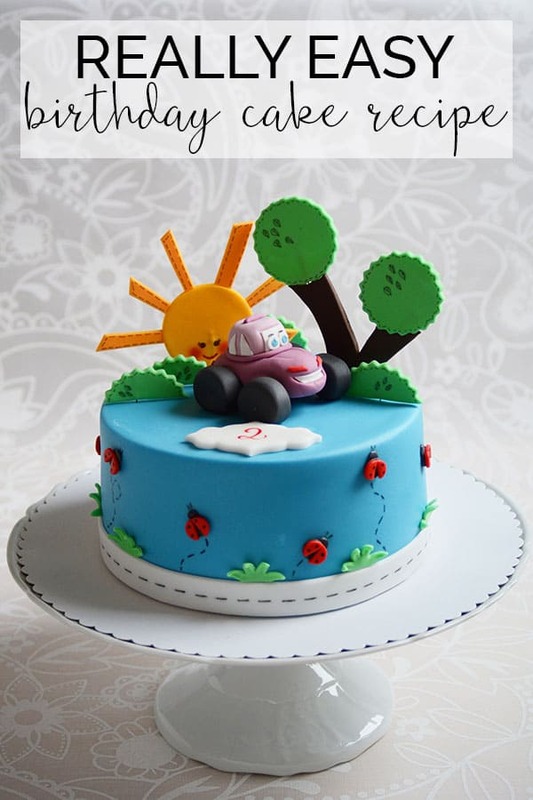 Simple Ideas for Making the Birthday Cake Perfect for your child. 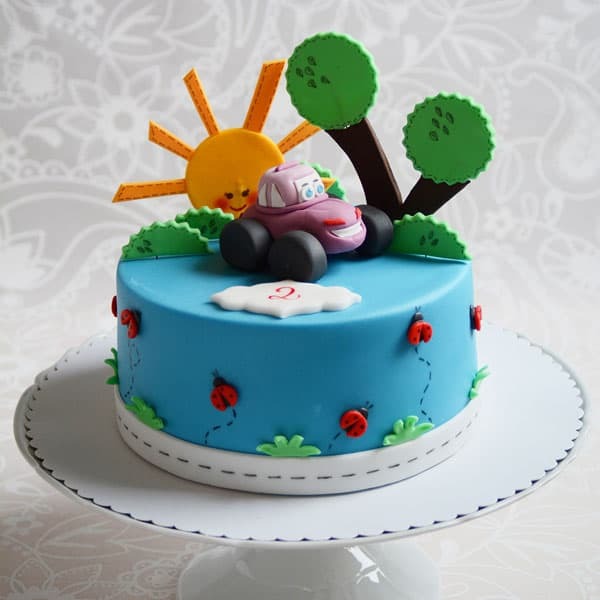 It’s surprisingly easy to make the cake to your child’s prefered theme with the coloured fondant you can find some cake toppers that would be perfect to add. 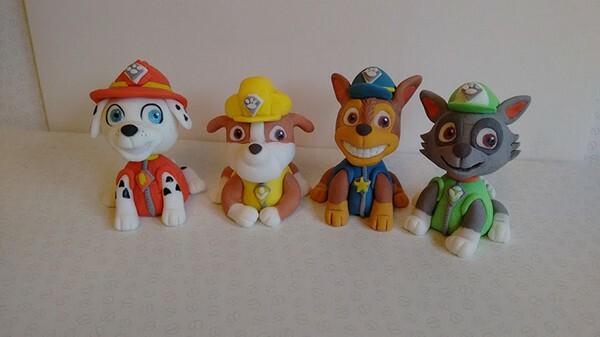 These could range from single numbers like this number 1 for a first birthday party or their favourite characters like My Little Pony, Paw Patrol, Scooby Doo, Whinney the Pooh or even classic themes like Under the Sea or Animals. If you find using icing sticky add icing sugar and wash your hands in cold water, dry your hands and continue. If you want to make this into a chocolate cake remove 30g of flour and add 30g or cocoa powder instead. Any off cuts you have from leveling off your cakes, make into bread crumbs mix with some buttercream until you have a moldable dough, roll into balls put in the fridge when hardened insert a lollipop stick and dip in melted chocolate the let the chocolate set and you have cake pops! You could always cover the cake in buttercream which is delicious and decorate with sweets or get your kids to do that part. Most importantly, have fun and Bon appetite! 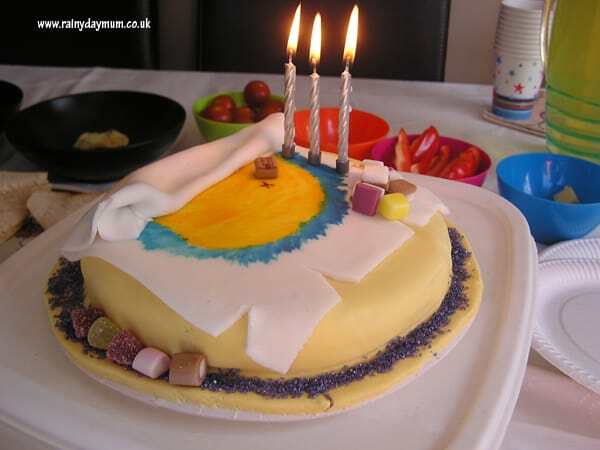 How to make a birthday cake with a simple recipe for a 7inch cake and step by step instructions. Plus ideas for simple decorations.